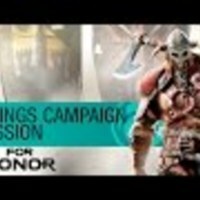 Watch the all-new For Honor gameplay walkthrough of a Viking story campaign mission. Join the Raider in his raid through the Myre, land of the Samurai and discover the unique For Honor combat system: The Art of Battle. Available in both solo and co-op mode. For Honor is available Valentine’s Day, February 14th, 2017 on Xbox One, PlayStation®4 system, and Windows PC. For Honor offers an engaging campaign and thrilling multiplayer. Enjoy the full experience with friends online, in split screen two-player co-op, or solo against AI. Choose your favorite warrior among a variety of unique heroes including deadly knights, brutal Vikings, and cold-blooded samurai. Able to turn the tide of battle and make their faction victorious, each hero comes with his or her own weapon set and combat style. Express your personality and inspire fear in your enemies by customizing each facet of your warrior, including your chest, shoulders, helmet, and weapon. The groundbreaking multiplayer modes will test your skill and take your adrenaline to the next level. In the heart of battle with your band of warriors, coordination and communication will be the keys to victory as you support your allies, slaughter enemies, and own the battlefield.